Change has been one of these alarming signals that we are entering a serious territory with potentially disastrous long-term results . The alarming weather has been increasing around the world, overall global temperatures rise, oceans are warming up, the ice sheets are shrinking, the glaciers are retreating, decreasing snow cover, sea level rise, declining Arctic sea ice, more extreme weather events, and increased ocean acidification. It's no surprise if we look at the rising carbon dioxide levels breaking above levels that have not been broken for centuries . Global warming brings more violent weather due to increasing temperature around the globe and can create massive amounts of damage to local or even national economies. For example, Hurricane Maria caused as much as $85 billion in insured losses, reports the Wall Street Journal . The overall damage caused by Hurricanes for 2017 has been estimated to $202.6 billion in damage, Bloomberg reported . Furthermore, an article published in the Proceedings of The National Academy of Sciences , it was said that the human-influenced climate change "is expected to lead to a greater incidence of high-intensity hurricanes." Overall, it would bring increased floods and substantially more rainfall, thus leading to more damage in the future. Weather is one aspect of the potential threats that can damage our economies severely and if the U.N. Chief is correct, can become more prominent sooner than we can imagine. Now let's focus on other important key indications that have been a persistent signal in the past. Comparing unemployment rates versus Market Momentum, we find that there seems to be a strong correlation. When the unemployment rate is at a minimum, meaning the economy is doing really well, there is often only one more way to go once the unemployment rates start to rise again, which is a contraction for the economic markets. During economic euphoria and low-unemployment, businesses often invest more than is necessary and over time this can cause unexpected losses due to lower returns. Low-unemployment also means a highly competitive economy due to more individual businesses, which in the long run is not sustainable and will in turn contract again. In the following image, we can see the comparison between the US Weekly Leading Index (WLI, on the top) - The WLI is part of a sequence of leading indexes that together flag cyclical turns in economic growth - and unemployment rates (bottom). As shown in the image we are at a low-unemployment rate range which has been a recurring signal in the past of previous markets topping. The confirmation signal we are looking for is a clear reversal from low-employment to increasing unemployment, indicating the economy is contracting and employers are unable to keep employees. Another common technical indication is a divergence between price or index and momentum. When the price or index is going up and momentum is supporting this too we can conclude that the economy is still growing with confidence. However, when we see the price or index increase but the momentum halting or decreasing then we are speaking about a divergence or less confidence. This is a signal for technical traders to take caution since there is a high likelihood of a downward reversal. What do we observe while studying the major economic markets? Looking at the S&P 500 similar divergences can be spotted. The index has retested the resistance line which had been broken down in 2008, fell down but recovered. 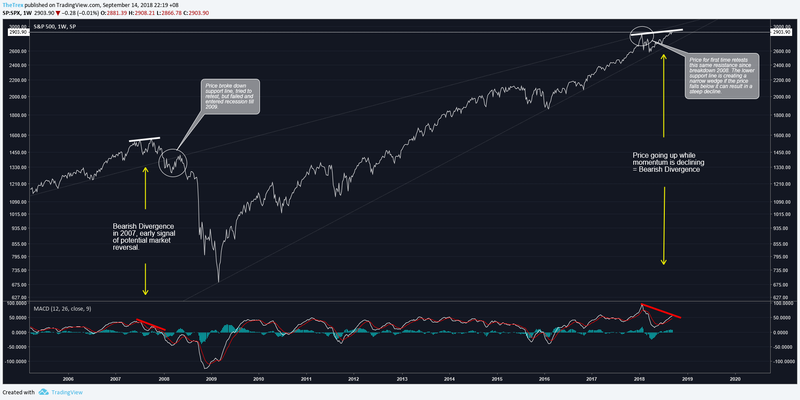 The lower support line and the resistance line are creating a wedge shape, based on unemployment and potential market divergence, it is likely that the index and thus economy can fall steeper once below. JPMorgan predicted that the next financial crisis will strike in 2020, Bloomberg reported . A closer look at the Financial Stress Index supports a similar timeframe. Overall we can see that St. Louis and Kansas City are in a decline of Financial Stress and have a similar movement. The narrowing wedge draws a trend from the breakout in 2018 to more recent resistance points. Once this trendline is broke upwards we could see an increase in financial stress and this target is ultimately around 2020. To summarize, global warming is causing more violent weather resulting in severe damage to local/national economies, studying unemployment rates the market has a likely tendency to reverse once unemployment rates start to increase again (this current range has been a significant recurring signal in the past), market divergences can be an early signal that confidence is declining and that the market will eventually enter a downtrend, JPMorgan predicts the next financial crisis will be in 2020 and financial stress data seems to support their claims.